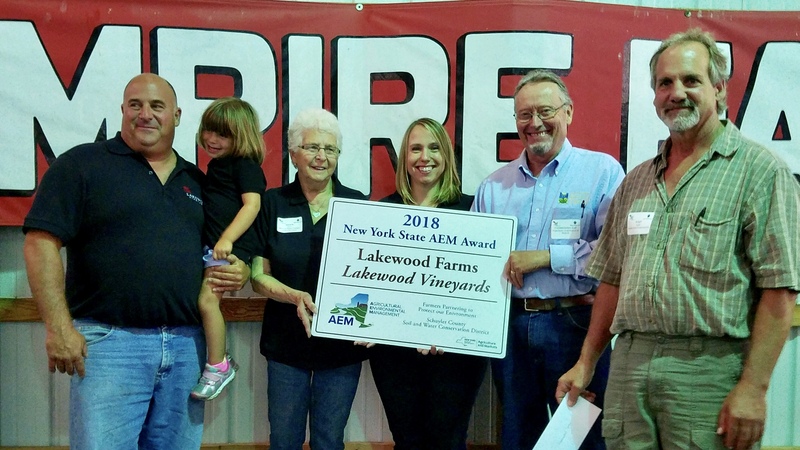 On Aug. 8, 2018, at the New York Ag Leadership Luncheon at Empire Farm Days honored Beverly and David Stamp as recipients of New York’s 2018 Agricultural Environmental Management Award. Ag Commissioner Richard Ball presented the Empire State’s top environmental award to the Stamps. Their 85-acre Lakewood Farm and Vineyards above Watkins Glen is a model of exemplary environmental management. David learned the importance of soil conservation from his father, Monty. “We recognized early that keeping the soil on the land was essential for the land and for downstream water quality,” he recalls. After their main market fell on hard times in the 1980s, the Stamps began replanting their vineyards with boutique varietals like Riesling and Chardonnay. In 1988, Lakewood Vineyards produced 5,000 gallons of wine. Today, production has grown to 100,000 gallons, and the farm provides 70% of its grapes. With David’s brother Chris as wine maker, Lakewood continues to grow. DESIGNED FOR NO RUNOFF: No-tilled, cross-slope vine rows plus cover-cropped row-middles and runoff diversion buffers naturally established a bullrush area in the middle of the vineyard. This third-generation partnership of David and his mother, Beverly, was one of the first vineyards to develop a nutrient management plan. Row upon no-till row of grape vines and mowed row-middles of cover crop mulch cross Seneca Lake’s steep (6% to 8%) western slope. With help from Schuyler County Soil and Water Conservation, thousands of feet of tile, diversions and waterways, plus grassed buffers, keep soils and nutrients in place. Halfway down-slope, David established a buffer zone to stop the flow of torrential rainfall. “Once soil washes, you can’t stop it,” he says. Combined best management practices save more than an estimated 1,000 tons of soil and nutrients annually. Cover cropping plus composted vineyard pommace helps build organic matter and soil quality. David believes every 1% organic matter gain increases an acre’s water-holding capacity by 20,000 gallons. That’s why pressed grape refuse is composted with horse and poultry manure in a novel forced-air system in a machine shed. Then it goes back on vineyard rows. The AEM Award boosts public awareness of farm efforts in preserving the environment. It’s co-sponsored by New York Department of Agriculture and Markets, Empire State Potato Growers and American Agriculturist.